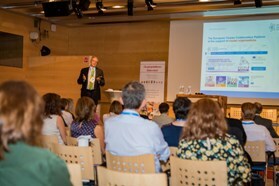 On July 5, 2018, a session on “Cluster Transforming Technologies and New Business Models” hosted by the Federal Ministry for Digital and Economic Affairs, the European Cluster Collaboration Platform and the INTERREG Europe project CLUSTERIX 2.0 at the WIRE-Conference 2018 took place. Pioneering technologies and disruptive innovation have a strong influence on traditional industry sectors and the development of new business models. Cross-sectoral activities between European clusters may stimulate the transformation of industries and bring forth new products and services. 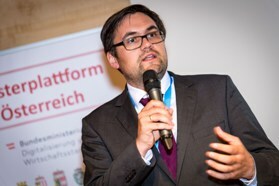 Dr. Bendl from the Austrian Federal Ministry for Digital and Economic Affairs focused on the European Cluster Strategy for Growth and showed many examples of cross-cluster activities of Austrian clusters. Prof. Dr. Heydebreck from the European Cluster Collaboration Platform gave an insight on how new business models for new cross sectoral value chains can be developed. Ms. Dage from DG GROWTH put a focus on the broad variety of European cross-cluster activities for new industrial value chains supported by the INNOSUP program. A new concept to identify cross-cluster synergies and new technologies was presented by Mr. Schneider from the Baden-Wuerttemberg agency. In the round-table discussion of European cluster managers success stories and learnings on the disruptive potential of cross-cluster technologies and their very interesting and practical project experiences have been shared. There was a common consensus of the European cluster managers that the field of digital technologies (Industry 4.0, artificial intelligence, IoT) has a great potential for disruptive innovation throughout all industry sectors. 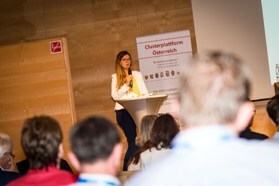 The National Austrian Cluster Platform was launched in 2008 by the Federal Ministry for Digital and Economic Affairs and is the information and cooperation platform for national and federal cluster stakeholders in Austria. The platform organises six working groups (“national innovation system”, “cluster praxis”, “EU policy”, “internationalisation”, “digitisation” and “environmental and energy research”) that are addressing technological and innovation issues. Each of these working groups addresses regularly specific, innovative and relevant topics. For more information about the National Austrian Cluster Platform see here.